India's main opposition Congress party has petitioned election officials to delay the release of a flattering new Bollywood biopic about Prime Minister Narendra Modi until after upcoming elections. Critics have said the film, due for release on April 5, is blatant propaganda and an attempt to woo voters before polls open six days later in India's almost six-week election. Congress, which hopes to unseat Modi in the vote, said on Monday that screening the movie, "PM Narendra Modi", would break election laws and that it should not hit cinemas until after voting ends on May 19. "This is no artistic venture. It is a political venture and that is what we have told the Election Commission and should not be allowed," senior Congress figure and former minister Kapil Sibal told reporters. The movie relates the Hindu right-wing leader's journey from his childhood days selling tea at a railway station to becoming chief minister of his home state Gujarat and leading his Bharatiya Janata Party (BJP) to a thumping victory against the Congress in 2014 elections. Under Indian election rules now in effect, the publication of any content deemed as campaign material -- including advertisements, films and even social media -- requires the election commission's prior approval. The commission said they have asked the makers of the Modi film to respond to the Congress's claims. 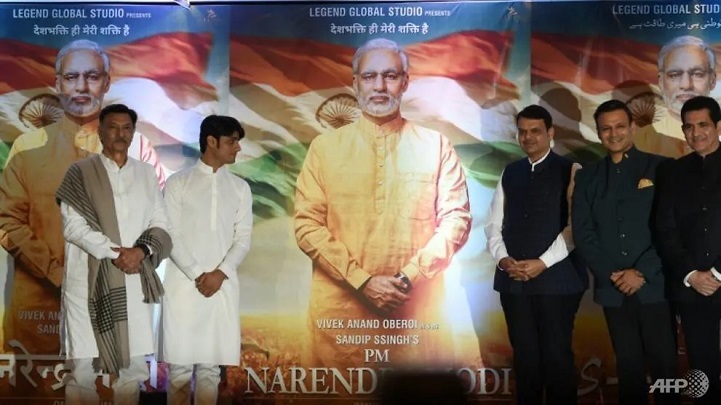 The makers released a two-minute trailer of the film last week saying it is "based on a true story", with Bollywood actor Vivek Oberoi playing Modi through various stages of his life. It covers his days as a Hindu "sage" in the Himalayas, and later as a nationalistic politician issuing warnings to India's arch-rival Pakistan. Critics and victims' families have accused Modi of doing little or nothing to stop days of rioting that left more than 1,000 people dead, a majority of them Muslims. Congress's petition came as Eros Now, an online video platform, on Tuesday released the trailer for its own hagiographical biopic of Modi. "Modi: Journey Of A Common Man", directed by Bollywood filmmaker Umesh Shukla, releases on the site next month. The ten-part series will "highlight many important incidents that made Modi devote his life for the service of the country," said a press release announcing the trailer.